I am entering my mermaid in the Perfect Sentiment Challenge PSC84. The theme is Sun and Sand. Since I just returned from a beach themed scrap camp weekend I thought this was the perfect challenge to enter in. If you get a chance head on over and check out all of the other great entries. I hope you have a SPLASH of a day! 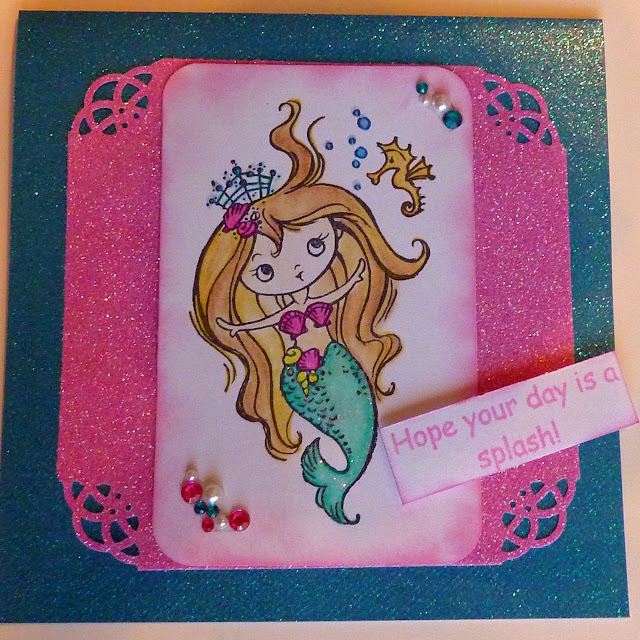 Card details: The mermaid stamp is by Stampendous. The saying was an unmounted and maker unknown. The card stock and gems are from my stash. I colored the mermaid with Prismacolor pencils and Mineral Spirits. I love your glittery papers. They remind me of wet sand. It goes well with your bling. Your mermaid is adorable, too. Thanks for sharing your card at The Perfect Sentiments Challenge. She is so adorable. Love your shaped card and all the bling! Thanks for joining us at Perfect Sentiment this week. Good luck.